VeryPDF's robust PDF conversion capabilities help you address common document dilemmas by converting PDF files into highly-editable Word and RTF documents, all while retaining the look-and-feel of the originals. Our broad set of PDF-to-Word conversion capabilities means you don't have to waste hours reformatting the content retrieved from your PDF files. Read below for some of the most useful. Using our PDF-to-Word conversion technology, you can quickly and easily create editable DOC/RTF files, making it a cinch to re-use PDF content in applications like Microsoft Word, Excel, OpenOffice, and WordPerfect. Text formatting. Retain the same size and color as the original text. Bold & italics. Retain bold and italic formatting wherever used. Maintain rotated text. Keep text correctly rotated, irrespective of its orientation. Ligatures. Easily convert all ligatures, such as fi, ft, ff, and more. Proper paragraphs. Generate Microsoft Word files with correctly formatted and easy-to-edit paragraphs. Justification & alignment. Maintain the correct alignment for paragraphs - left, right, centered, or fully justified. Bullet and numbered lists. Ensure the layout and indenting of bulleted and numbered lists mirrors the original PDF. Columns. Reproduce multi-column text layouts using Microsoft Word's built-in Column tools. Convert tables. Turn tabular content into editable tables. Broad image support. Easily convert all types of images, including pictures, screenshots and photos, with complete support for the PDF specification's image filters. Scalable charts, graphs, diagrams and vector images. Convert vector-based images into scalable objects in Microsoft Word, wherever possible. Microsoft Word drawing shapes. Re-use graphics (originally Shapes and SmartArt) in Microsoft Word. Transparency. Accurately retain transparency in images. Backgrounds. Convert background images and ensure they remain behind the primary page content. Effects.. Retain the look of effects like textures, patterns, shadows, and mirroring. Order content. Correctly stack images and text in front or behind other elements so they appear the same as in the PDF file. PDF to Word Converter instantly converts PDF files into Microsoft Word documents that look just like the original - complete with all formatting and images! Information is set free - free to be edited and free to be integrated into your documents. 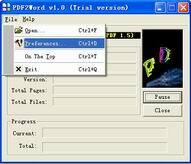 PDF to Word is a batch PDF Converter that you can convert a lot of PDF files to word documents once time! saving your time!